When the acquisition is complete, Toronto-based Brookfield will be among the largest alternative money managers in the world, with total assets under management of about $475 billion. By comparison, Blackstone Group LP had $472 billion in assets under management, Apollo Global Management had $280.3 billion and The Carlyle Group LP had $216.5 billion in assets under management as of Dec. 31. Brookfield is paying $4.7 billion in cash and stock for a 62% majority interest in Oaktree Capital Group LLC, which will be taken private as part of the transaction. The business combination will make Oaktree part of a much larger global money manager with somewhat complementary investment businesses. Indeed, in its March 13 joint news release announcing the deal, both companies stressed that there will be little overlap in investment strategies. Oaktree will continue to operate independently, but under Brookfield's umbrella, according to documents filed with the SEC. "Brookfield's investment strategies are complementary to ours with no material overlap," according to an Oaktree FAQ on the deal attached to the SEC filing. "Even where it may seem there may be some overlap, for example in infrastructure or real estate funds, each company operates in very different manners, resulting in minimal true overlap with respect to regional focuses, transaction sizes or markets, for example." The Brookfield-Oaktree combination could be the first of many mergers in alternative investments, as an increasing number of investors trim their rosters of money managers. After the 2008 global financial crisis, investors looked to reduce their manager lineups, realizing that too many managers gave them index-like returns with much higher costs. And for their part, alternative investment managers are adapting to a new world in which they need to have the breadth to offer investors multiple strategies. Credit managers, in particular, need to have a degree of heft, at least $100 billion in AUM, to be taken seriously as a lender, sources say. "This deal further transforms the alternative investments world," said David Fann, New York-based president and CEO of TorreyCove Capital Partners LLC. "Many of the largest LPs are reducing the number of key relationships to just a handful. With this, Brookfield is capturing investor mindshare across the alternative investment landscape." It remains to be seen if other large alternative investment money managers will orchestrate mergers, Mr. Fann said. There have been a few, smaller mergers involving alternative investment managers. In October, traditional and alternative investment money manager Franklin Resources Inc., which operates as Franklin Templeton (BEN) Investments (BEN), acquired credit manager Benefit Street Partners, which had $26 billion in assets under management as of Sept. 30. At the time, Franklin Templeton had $717 billion in AUM. Brookfield has also been a buyer of alternative investment managers lately. In 2018, it acquired Houston-based master limited partnership and energy infrastructure manager Center Coast Capital Holdings, which had $4 billion in assets under management. In late 2017, it bought a European manager with $1.5 billion of core renewable power assets. The move to invest more capital with fewer alternative managers is not the only force driving managers toward consolidation, said Nathan Bragg, Charlotte-based managing director and head of corporate strategy at Barings Asset Management, the money management arm of Massachusetts Mutual Life Insurance Co. Alternative investment managers are being buffeted by industry headwinds of fee pressures and less organic growth overall, including lower inflows, he said. When a firm has broad array of alternative investment offerings, it helps combat fee trends in the industry broadly because the managers can offer thematic and multiasset class investment strategies, he said. Two years ago, to help position the company for the changing market, Barings consolidated, bringing together its various money management businesses — Babson Capital Management LLC, its subsidiaries Cornerstone Real Estate Advisers LLC and Wood Creek Capital Management LLC, and Baring Asset Management Ltd. — under the Barings name, Mr. Bragg noted. Barings has $303 billion in assets under management, with roughly 25% in alternative investments. So far, there have been a number of smaller acquisitions involving alternative investment managers, he said. "Broad, transformational acquisitions are harder to transact," Mr. Bragg said. Even so, he said he would expect consolidation to continue over time. Oaktree had $120 billion in AUM as of Dec. 31, down 3% from the year before. Of its total AUM, 76% is in credit strategies. Oaktree's credit business includes its 20% interest in credit manager DoubleLine Capital LP. DoubleLine accounts for 9% of Oaktree's fee revenue, Oaktree's regulatory filing shows. Another 59% of Oaktree revenues is from its closed-end funds, 19% from open-end funds and 13% evergreen funds. The two businesses are not without overlapping investment strategies. Some 10% of Oaktree's AUM is in private equity, 10% in real assets and 4% in public equity businesses. Brookfield, which had $354.7 billion as of Dec. 31, is considered a leader in the real assets business. It has $188 billion in real estate, $61 billion in infrastructure and $47 billion in renewable power. Like Oaktree, Brookfield has a private equity business, amounting to $42 billion in AUM. However, Brookfield offers primarily equity strategies and its strategies are pro-cyclical whereas Oaktree's investment strategies are counter-cyclical, Howard Marks, co-chairman, and Bruce Karsh, co-chairman and CIO, said in a letter to clients March 13. Brookfield also has a credit business but the firm largely originates loans, while Oaktree buys and sells existing loans, sources said. The Oaktree deal fills a hole in Brookfield's lineup of investment options, making it a full-service manager, industry insiders said. "Brookfield is a leading player in infrastructure, real assets and real estate," Mr. Fann said. "Oaktree is a dominant distressed debt player. After this deal, Brookfield will become a major global provider of alternative investments with offerings that work in both up and down markets." Brookfield executives declined to comment beyond the news release. Oaktree executives were unavailable to comment. Oaktree executives have made no secret that going public was a disappointment. "As a public company, we've experienced the market's lack of enthusiasm for an asset manager that's more concerned with its clients' interests than with growing AUM and profits when it thinks growing would be a mistake," Messrs. Marks and Karsh said in the client letter. "The public listing also hasn't provided all of the liquidity we sought in order to facilitate generational transfer." Even so, the pair said they plan to remain at Oaktree for the long term in their current roles. "While we're not sure we can commit to 'forever,' we do plan to remain around for a very long time," Messrs. Marks and Karsh said in the client letter. The key risk of a merger is "the retention of key investment people managing the funds," Mr. Fann said. The deal does offer liquidity for the founders, employees and others who own Oaktree. 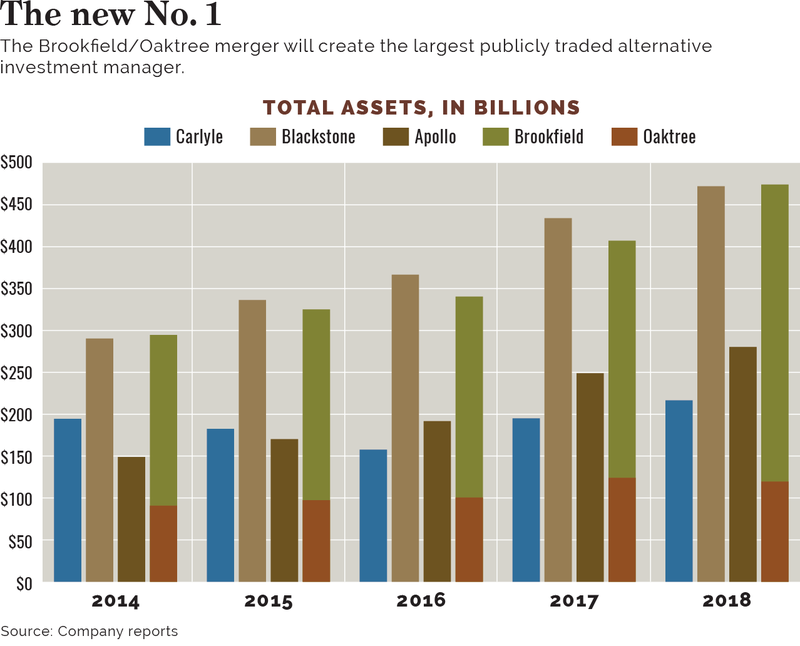 Under the terms of the transaction, which is expected to close by year-end, Brookfield will buy all of Oaktree's public partnership units and 20% of the private units held by Oaktree's founders, employees and ex-employees, according the client letter. This will leave Oaktree retaining a roughly 38% ownership. Oaktree's founders and senior managers will be able to sell their remaining units in equal parts between 2022 and 2026. The rest of Oaktree's employees and ex-employees will have liquidity from 2022 to 2029. Oaktree was one of the first alternative investment firm to go public, going semi-public in 2007 and fully public in 2012, but it is not the first to find a buyer to help it go private again. In 2017, hedge fund manager Fortress Investment Group went private in a deal with SoftBank Group. Fortress had gone public in 2007. Some publicly traded alternative investment managers have been disappointed with their public listings, expecting a public company would have an easier time gaining scale, sources said. However, the alternative investment model, including the delay between investing capital and earning a return on that capital, has hurt the stock prices of publicly traded alternative investment firms. A number of investors declined to comment as they received the news at the same time as the public, but others are unconcerned with the deal. "We don't currently have any concerns with Brookfield/Oaktree at this time," said Bob Jacksha, chief investment officer of the $12.9 billion New Mexico Education Retirement Board, Santa Fe.